Not that long ago I saw a Facebook post showing zucchinis used as a boat for a variety of different concoctions. I have to admit it was a clever idea – an interesting way to avoid the tortilla. I tucked it away in my memory for a rainy day as just something interesting, and kind of cool, nothing more. Since both being diagnosed insulin resistance and starting my new health and wellness program, cutting high glycemic carbohydrates was a must. Making smart choices health wise was actually pretty simple. I’m not the biggest sweet fan so cutting out refined sugar wasn’t that hard to give up. Bread, ah yummy, warm, rich bread. That was the hardest followed by hot starchy potatoes. Finding alternatives for these high glycemic foods became a mission of mine. Thank goodness for a good memory and Pinterest. On my quest, I saw again the multitude of uses for the zucchini as a boat. I had some leftover turkey from Christmas (I’d frozen the leftovers so I could use them for future recipes over the next month) and thought it might make for a fun add in to a zucchini boat. What I came up with after looking at all the options was a turkey zucchini enchilada boat! 1. Preheat your oven to 400 degrees F.
2. To make the zucchini boats, I first sliced off the stem end, and sliced them in half vertically. Next, I used a melon baller to hallow out the center of the center zucchini, making sure to keep the scraps of zucchini. 3. I added them to a pot of boiling water and blanched them for about 1-2 minutes. I removed them and drained them to use later. 4. To make the filling, I added the butter, onion and garlic to a sauce pan to cook until the onions were translucent. Make sure to cook them on a medium heat or the garlic could burn. 5. Chop the scrap zucchini. I added it and the cilantro to the sauce pan and cooked for about 1 minute. 6. I added the spices – oregano, onion powder, chili powder, salt and pepper – cooking for about 5 minutes and stirring frequently. 7. Next, I added the tomato paste, turkey and water, mixing them together and cooking until heated through. About 3-4 minutes. Note: Make sure to keep stirring or the tomato paste will burn. 8. I poured a small layer of enchilada sauce in the bottom of the roasting pan. 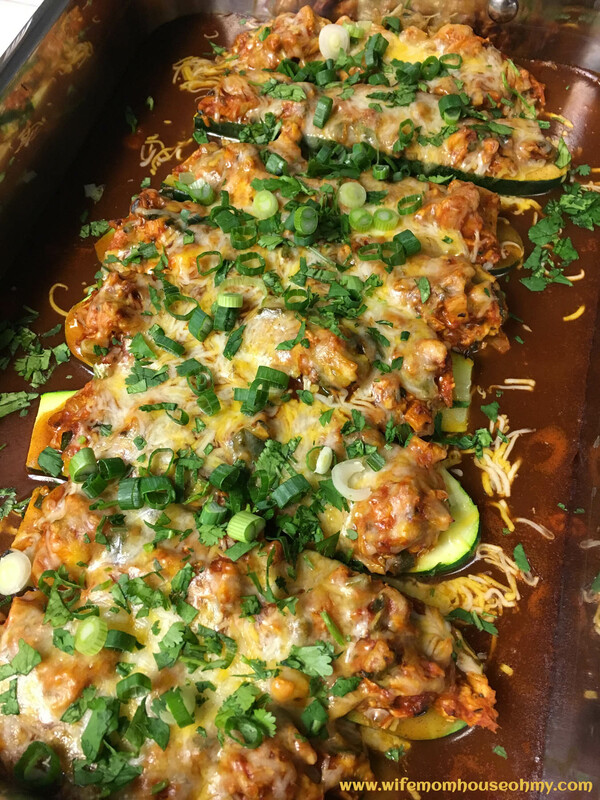 I then filled each zucchini boat with the filling turkey mixture. Make sure to firmly pack the boats. 9. I poured the remaining enchilada sauce over the boats, and topped them with cheese and extra cilantro and green onions. 10. Next, I placed it in the oven to cook until the boats were tender, which takes about 30 minutes. When done, I served it as I would any enchilada, pulling out one or two per person. 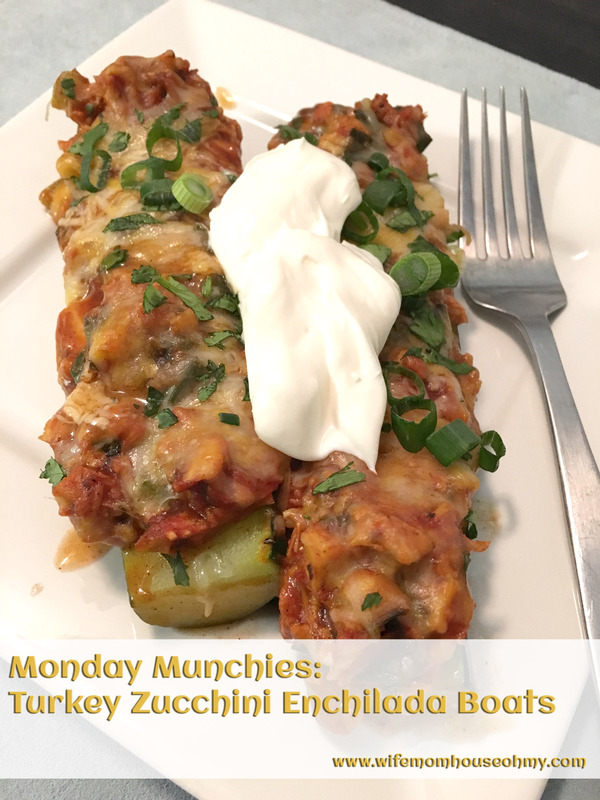 I also chose to top the turkey zucchini enchilada boats with Crema Mexicana. Its like sour cream but it is saltier in flavor and milder in its vinegar profile. It was a hit all around and from a frugal health conscious mom standpoint, it was awesome! I repurposed my turkey so no waste. The ingredients I needed were inexpensive so not a budget buster by any means. AND it was a low glycemic and low fat meal even with the cheese and Crema Mexicana. In my book, that’s a definite win-win!